It’s long time since I have baked a quick bread. The last time I baked this for my friends and it was a hit. I had used bananas instead of eggs, so the bread tasted more like bananas. That’s the only reason I don’t like using bananas as an egg substitute because it’s flavor/smell will dominate the baked dish. Whether it’s a carrot cake or chocolate cake, it’s going to taste like a banana only. So this time I decided to use flax seed meal as the egg substitute. What is a Quick Bread? 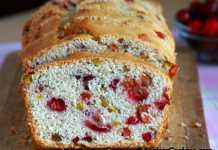 As the name suggests, “Quick Breads” can be baked quickly, when compared to the traditional yeast breads. Quick breads are leavened with baking powder and/or baking soda, not yeast. So you can mix, bake and enjoy these baked goods in less time. Quick breads can be sweet or savory. 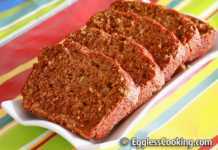 One important thing to be noted while baking quick breads is, mixing the wet and dry ingredients only until moistened. Few lumps in the batter is fine, because over-mixing causes the gluten in the flour to develop and the result would be a coarse and tough bread. I had some dried cranberries left after preparing these “no-bake” bars, so I wanted to use it before I could forget all about it and find it out after 3 months while cleaning the pantry. I also had 2 cranberry bread recipes in hand. One was the traditional yeast bread and another one a cranberry orange quick bread (from the book Baking for Dummies). Hands down my choice is the latter, because I’m not yet ready to bake with yeast. I have this preconceived notion that I cannot handle yeast, it’s difficult. 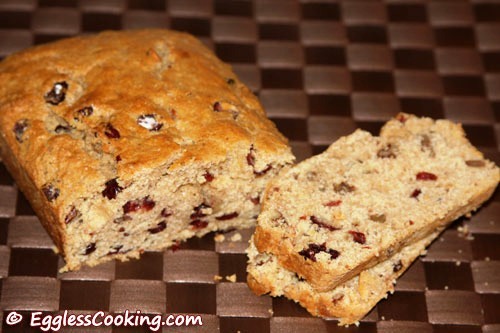 But the quick bread required fresh cranberries which I didn’t have. So I came up with a recipe combining those 2 recipes, making few changes here and there. The bread came out quite decently. Preheat oven to 350F/180C for 15 minutes. Grease and flour a 9×5 inch loaf pan. each other and settle at the bottom of the bread. Whisk/blend together the flax seed meal and water until white and foamy. I used Magic Bullet to blend it. In a small bowl, mix together the flax seed mixture, orange zest, orange juice, oil and applesauce (if using). Stir the wet ingredients into the dry ingredients and mix until just blended. I felt that the batter was thick, so I added another 2 tablespoons of orange juice. You can also dilute it with water or any type of milk. Do not over-mix. Few lumps should be fine, it would dissolve while baking. Pour the batter into the prepared pan and bake for 60 minutes, or until a toothpick inserted into the center of the loaf comes out clean. I checked mine for doneness around 48 minutes and the toothpick came out clean. I removed the pan out of the oven after 50 minutes. Cool the loaf for 15 minutes before removing it from the pan. Finish cooling the loaf on a wire rack. I’m not a patient person when it comes to tasting something I have baked. Also I did not notice the tip about slicing banana/zucchini and cranberry breads the day after baking it, so I sliced it anyway and it did crumble. So be patient because they slice and taste better the next day. Everybody liked the taste of the bread, the sweetness was right but it did have a mild raw smell. I’m not sure whether the culprit was the whole wheat pastry flour or the baking time. Even though the time given in the original recipe was 60 minutes, the toothpick came out clean after 48 minutes itself. Maybe I should try using only all purpose flour the next time. 2. Mansi’s Vegetarian Thanksgiving Recipe Carnival. What is Thanksgiving without cranberries! 3. Egg Replacement Event – Flax Seed Meal hosted by me. Thanks for the delicious recipe. I used 1 Tbs. of flaxseeds und dried blueberries, cranberries and raspberries and cherries. The bread was very tasty. I also used a mixture of dark and white sugars and 1/4 cup dried coconut. This bread was DELICIOUS! I’ve already made 4 loaves. The whole family loves it and it disappears fast. I’m looking forward to trying other recipes on this great site. Thank you! This is my kind of recipe! I replace eggs with flax/water (or skip them altogether suggested by pcrm.org), I reduce the fat and add applesauce. I also reduce the sugar, usually by half, or I either add a little more applesauce or use 1/4 honey. If we didn’t care about our wellbeing, we’d just dunk the butter stick right into the sugar (anyone see Meg Ryan in “The Women”), and then deep fry it (state fair fodder). Most recipes reduce the fat, but up the sugar. I don’t want heart disease to affect my life, but I also don’t want diabetes either — not to mention the mood swings from a blood sugar rush. Like anything, once you get over the addictions from excessive sugar and fat, everything is so much better. I tried this bread today. I used the 1/2 c of applesauce instead of any oil at all. This bread is faulous. Thank you so much for the recipe! That’s great to know Barb. Thanks for trying the recipe. I love your site. I have tried many of your eggless cake recipes. Today, I baked this quick bread – it was so good. Even with your detail notes about it tasting better the next day, the 1st loaf was finished within the first hour. I was able to keep my husband away from it for about 10 minutes – the challenge ws too much for me, so I gave in and cut… it taste too good. I had to make another loaf. I make some minor change – added about 1/4 more cup of OJ and since I had some 1/2 & 1/2 milk on hand – added about 2 tbsp. Thanks again for a great recipe. This one is a keeper. Thanks a lot for your generous compliments, Minu. I just made this recipe.I halved it and baked it in 2 mini loaf pans for 32 minutes.After reading your notes,I increased the amount of liquid ingredients a little-added an extra 20 mls of apple sauce and about 2 teaspoons of oil.I also added double the amount opf flax .Inspite of all your warnings,I couldn’t resist cutting off one teeny slice to taste.The bread is very tasty-I like the subtle orange flavor.I also used orange flavored craisins..has anyone made this with fresh cranberries?Does it taste any different?Thanks for sharing.It’s a keeper! Thanks for trying it Geetha. I haven’t used orange flavored craisins, that sounds very delicious. Thank you so much for sharing your experience, recipe and detailed notes about changes that one can make. I tried baking in the past without egg and it did not come out good, but your detailed notes are very helpful. 2 teaspoon of soda == 1 teaspoon of baking powder + 1 teaspoon of flaxseed (this is in addition to flax seed your recipe calls out). You’re welcome Mona. The change you have made is good, I too will try it when using flax seed powder. i am fairly new to your website. i never tried eggless recipies before.. but after trying a few of your recipies, i am hooked. this bread was a total hit with my wife and kids…. they are asking me to make it again…. Keep up the great work…i look foward to more delicious recipies. Alex, thank you very much for trying the recipes and for taking the time to record your feedback here. Baked this today after my sucess with the choc cake. I followed your recipe with few inputs from the book The joy of vegan baking. The bread was good.Thank you once again for sharing this wonderful receipe. Thanks for the feedback Priya. I’m glad you liked the bread. That’s wonderful Kiran. Hope you like the taste too! Thanks for trying the recipe. Thank you very much Kiran. Madhu, I have whole wheat flor (not whole wheat pastry flour). Would that do? Hi Deepa, saw your comment just now. Yes you could use 50% of each all purpose flour and whole wheat flour. Bake it for an extra 3-5 minutes. I would recommend you to try the carrot cake. It’s from Indira’s site and she uses banana for the egg substitute. I have baked it so many times and every time it comes out so well. I have tried it with wheat flour also and have not felt the difference in taste. corn starch; this will equal whole wheat pastry flour. what is the flax seed mean and ground flax seeds – i have whole flaxseed which i grind in coffee blender – can it be used in place of flax seed meal ? Flax seed meal, flax seed powder and ground flax seed all refer to grinding whole flaxseeds only. These 3 terms are being used in most of the vegan books and so I have also used it interchangeably. Tok Tok Tok pls open i have something for u. come and pick up from adlaks. Great madhu, bread looks perfect. Seeing ur love for baking bread i wanted to tag u for a blog baking event, but before doing so wanted to ask u if its ok to do so? I have made a vegan cheese cake brownie with both flax meal and tofu – is it alright for your event or does it have to be only flax? I made a similar one yesterday Madhu..Will try with flax seeds next time. Bread looks yummy,like the recipe a lot, i am all for quick baking. Every year we invite lot of friends over for Thanksgiving dinner and make all non-Indian, Vegetarian food like Asparagus risotto, cranberry chutney, stuffing, pumpkin pie, something with artichokes, etc. 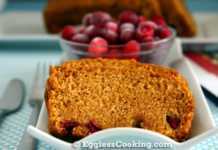 This year I will try this cranberry cake 🙂 I like your various creative uses of flax seed meal. I didn’t know that flax seed was used in Indian cooking. After seeing your comment I immediately googled to find the Tamil/Telugu name for flax seed and found it out also. If you plan to bake this cake, try using all purpose flour itself. The bread looks real yumm.